HMDX Go Portable Speaker - Available In Blue and Silver Only $5.49 Shipped! You are here: Home / Great Deals / HMDX Go Portable Speaker – Available In Blue and Silver Only $5.49 Shipped! HMDX Go Portable Speaker – Available In Blue and Silver Only $5.49 Shipped! 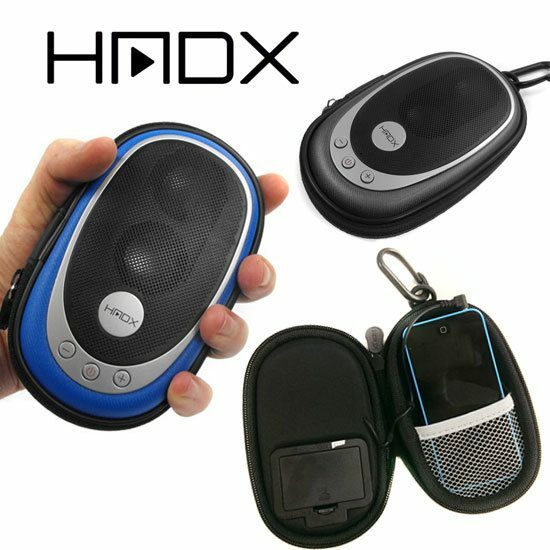 The HMDX Go Portable Speaker is a portable speaker case that clips onto a bag or backpack – simply plug the 3.5mm audio cable into your phone or mp3 player to start listening.! The HMDX Go Portable Speaker – Available In Blue and Silver for Only $5.49 Shipped has external volume controls, while it’s internal pocket holds your mp3 player or cell phone (fits iPhone). Plus, it runs on batteries!